Situation Normal until the arrival of Michael Menes and Leland Faulkner, and then the world gets turned on its ear. In the tradition of the classic American comedy teams, SNAFU! 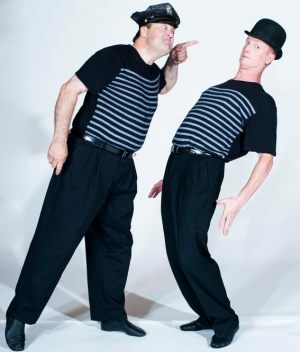 combines sketch comedy with slapstick, awesome juggling, crazy gags, and mind-boggling magic in a show that brings to life “Murphy’s Law.” Michael and Lee are two Maine-based touring artists who first met in Maine at Celebration Barn. They recently took SNAFU! to China where they opened the 2015 Shanghai International Comedy Festival. This will be our first chance to have them join us at the annual Moisture Festival… a treat!